Those of us living in cold winter climates have experienced this one way or another—a tree or tree branch broken under the stress of a snow storm. Every winter roads are blocked, property is damaged, and people get hurt because of fallen trees, but there are steps you can take to minimize this risk, and also ensure that your trees will remain a part of your landscaping. Pruning trees for dead or weak branches will not only keep your trees from causing damage, but in younger trees, it will often result in a burst of growth in the spring. This will result in beautiful landscaping and stronger trees in the summer months. Check out our winter tree pruning tips and tricks below. Cracking branches: If you see any cracks in branches, it's just a matter of time before these branches break under pressure. It's best to get rid of them. Decaying branches: Dried out and decayed branches should be removed before they fall off naturally. Disproportional branches: If a branch's diameter is 2/3's larger than the diameter of the trunk, it's likely the trunk won't be able to support the branch when put under a great deal of stress. Diseased branches: Disease can spread to the entire tree if it's not addressed. This should be a rare occurrence, but it's something you should check for nonetheless. 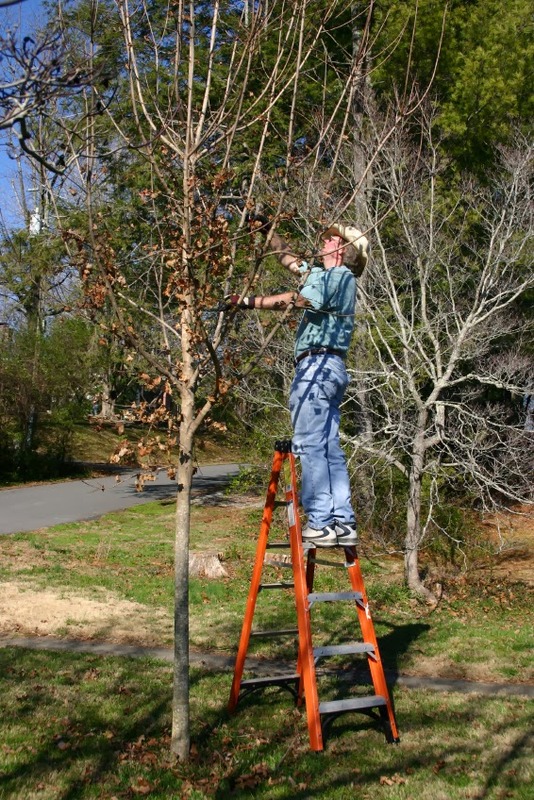 Work from the top down: Ladders can be used for pruning trees, but it's best to use use a pole trimmer or clipper to reach high branches. If the job is out of reach, you should call a professional. Cut with the collar: You want to cut a branch parallel with the collar of the branch (the part where the branch and trunk meet). You also want to cut just outside the collar, but not so far that you leave a protruding stub. For branches that can be cut using clippers (and haven't formed a collar) cut as close as possible. Cut with the natural shape of the tree: The tree will look best and thrive if it's cut along its natural shape. Cut large branches in multiple sections: On large branches, especially if you're using a chainsaw, cut the branch in multiple sections. Don't try to cut the entire branch off in one cut. You could injure yourself, damage the tree, or both. Once your tree is pruned, you'll have the peace of mind that it won't cause any damage in the winter and that your yard will look great in the spring. Shop HLSProParts.com for the best selection of chainsaw parts and have your equipment ready for whenever you need it.